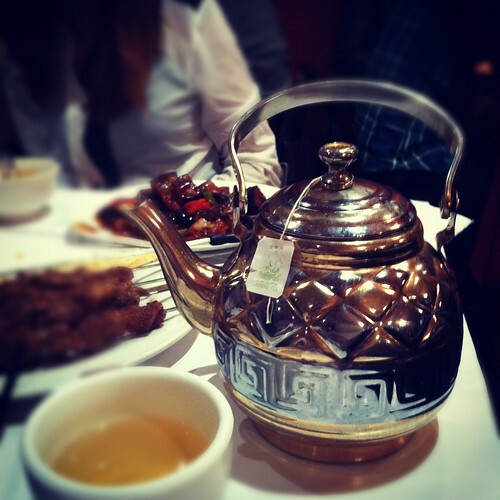 Uighur Restaurant | A Weblog about.... food. I just hit my head against a table. It’s my own fault really. A relatively quiet evening the night previous was backed up with one too many single malt scotches during one of my many beloved marathons of NCIS LA (yes I’m a fan, yes you can judge me, and no I don’t really care) which meant that I woke up today feeling a little worse for wear. With my boss away on holidays and my current work life being a little more relaxed than usual I thought I’d take it upon myself to have a quick little sit down/lie down/ nap behind my workmate’s desk whilst she regaled me with stories of her love life (I’d go into more detail but she’s just given me a quick little lecture about including her in my blog posts). Anyway, when it was time for me to get up I did so quickly without any thought and banged my head against the back of her desk. Forgive me if I’m not making sense at the moment, I may or may not have a concussion; at the very least I’m feeling quite sore. I realise that you my dear readers care little for my own general idiocy but hey, when conversing one always needs a good ice breaker and everyone loves a good self-inflicted injury anecdote. Besides, the cold this winter has brought along has meant that things have been a little quiet in my neck of the woods, being in an endless lockdown with my good friends’ beer, wine and spirits. So where have I been eating out lately? With Sydney deep in the craze that is dude food, and more recently rekindling it’s love for old school Cantonese food in a modern ‘ironic’ kind of way that the hipster generation seems to be defined by, I’ve found myself seeking out my old favourites like pho, ramen, hand-pulled noodles, basically anything quick, cheap and sometimes dirty… with the promise of cheap beer always a help too. So this my dear readers is how I found myself at Kiroran Silk Road on a cold and blustery night that I have trouble remembering other than the food that was shared and the haircut that I’d received earlier in the evening and I’m still currently sporting. Kiroran Silk Road (for the sake of this post let’s just call it KSR for the remainder of it) is an Uighur restaurant closer to the Liverpool Street end of Dixon Street, sitting right next to another Uighur restaurant that’s been creatively named Uighur Restaurant (KSR is up the stairs, Uighur Restaurant is street level). It’s an interesting cuisine and those not familiar with it or the people themselves would do well to do a quick Wikipedia search. If you can’t be bothered with that then I’m just going to throw out a blanket description and call it Muslim Chinese. 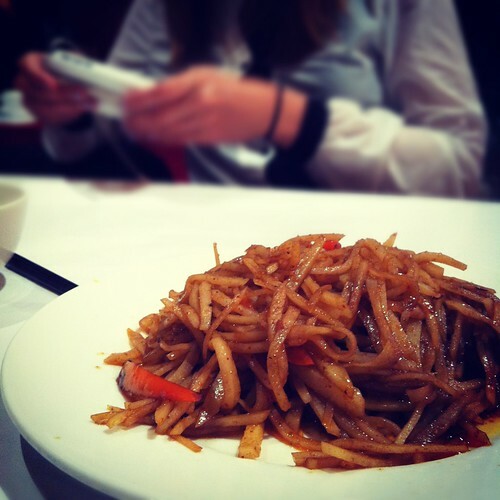 One of my favourite things to eat when it comes to regional Chinese food is fried potato shreds. I call them Chinese French Fries. Sometimes they’re served cold in a salad, sometimes they’re warm, but they’re almost always awesome. The version at KSR is hot in both temperature and spice factor. Eat it with some rice for that perfect combination of carb and carb. 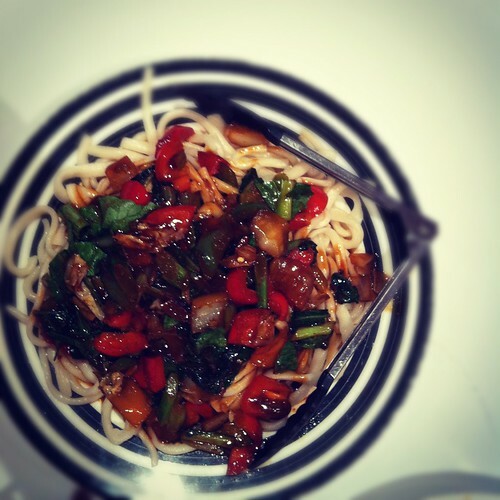 I first fell in love with this cuisine when I realised they were masters of hand-pulled noodles. I love a good hand pull and KSR’s version has a good chew topped off with some fresh veggies and a great tasting cumin and chilli laced sauce. 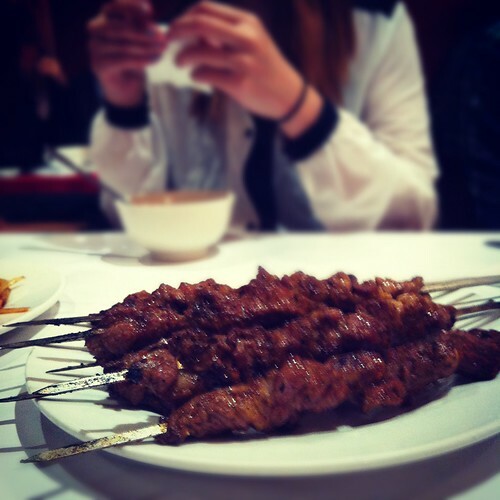 Another dish they do well here is the Lamb Skewers. I can’t think of a time when I’ve had bad lamb skewers, they’re so heavily seasoned that they’re always bound to rock in some way but, KSR’s lamb skewers go to the next level. The meat isn’t too chewy and the fat is charred enough to pop nicely in your mouth. Yes the skewers are good here. So after working your way through some carbs and meat you’ll probably feel the need to get your fill of greens in. 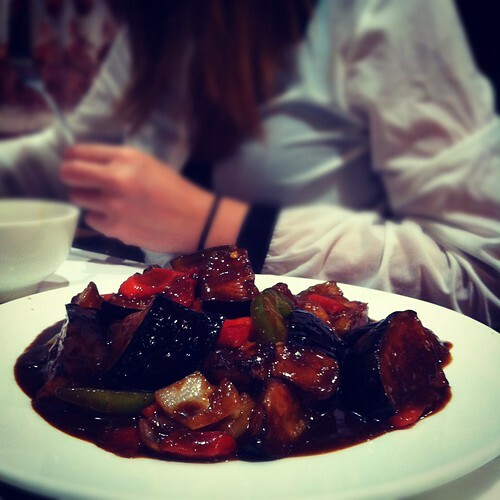 Ok so this isn’t green but may I suggest the Eggplant in Uighur style? It doesn’t look like much but, if there’s a better eggplant dish in Sydney then I haven’t met it. The eggplant is so soft and is drowned in a sauce so rich and moreish (do I get points for using the word moreish for the first time in my blog?) you’ll wish you ordered some of the bread (nan) or meat pies to soak it all up with. Ok please excuse me while I go for a lie down in the sick bay. My head still hurts.